I wasn’t quite sure what to call this jerky? Gluten-Free Beef Jerky? Low-FODMAP Beef Jerky? 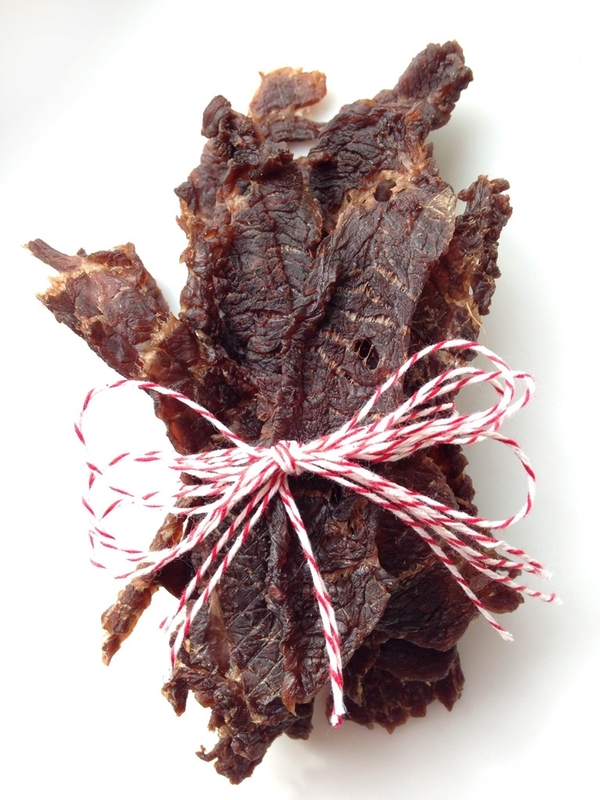 Easy Paleo Beef Jerky? Refined Sugar-Free Beef Jerky? Tasty Beef Jerky (now there’s a winner)? Because all the names fit. I settled on “Easy Soy-Free Beef Jerky” because I think that’s what makes this recipe a standout. Most jerky you buy contains soy sauce—some use tamari (which is gluten-free soy sauce), some do not (so read those labels). This particular recipe uses coconut aminos, a slightly less salty coconut-derived replacement for soy sauce. After much trial and error I have come to learn that the making of jerky is an art. The subtlest of alterations to a recipe can have a profound effect on the final taste. What I really like about this coconut amino-based jerky recipe is that no one ingredient is overpowering, and there’s a perfect balance of sweet and salt. I’ve been making big batches (3-4 pounds of meat at a time) because having a high-protein snack at the ready keeps me from scarfing my way through a bag of corn chips—and I’m never at a loss for what to pack the kids for a school snack. When making jerky, choose a very lean cut of meat. Fat (even dried fat) will go rancid—that’s why I refrigerate my jerky to appease my paranoia. Top round steak, flank steak and rump roast are the best cuts for making jerky. About half the time I will use bison. I could have kissed the butcher at Whole Foods yesterday. As he was wrapping up my three pounds of London broil, he asked if I wanted him to slice it for me. Oh yeah, baby! “You don’t mind?” I asked. He said it would be a pleasure. And he kindly saved me 15 minutes of slicing it myself. So note to self, ask your butcher to slice the meat for you. If you have already have the meat home and will be cutting it yourself, placing the meat in the freezer until firm but not rock hard will help you achieve super-thing slices. For jerky that the kids can easily chew (and not choke on), cut slices across the grain, in 1/8″ thick strips. If you prefer gnawing on your dried meat, slice with the grain into 1/4″ by strips. Combine coconut aminos, apple cider vinegar, sugar, liquid smoke, salt and ginger in a large glass container with tight-fitting lid or in a large zip-top bag. Close and shake until most of the sugar and salt has dissolved. Set aside. Add meat to the brine, seal, toss and refrigerate for 6-8 hours, turning once or twice. Preheat dehydrator at its highest setting (my Excalibur's is 165?F). Drain off brine, discard slices of ginger and arrange strips of meat on dehydrator trays. Place trays in dehydrator and dehydrate 4-6 hours at your dehydrator's highest setting (my Excalibur's is 165?F). How do you know when jerky is done? Test a strip for dryness by letting it cool to room temperature then slightly bend the jerky. The meat should crack, not break, when bent. It should be firm, but flexible. If it snaps it was dehydrated too long. It will still taste fine, it just may be a little crispy. If it doesn't crack, dehydrate until it does. After a batch or two you will get the hang of it. Store in an airtight container in the refrigerator and enjoy within a week or two. Round steak, flank steak, or rump roast are the best cuts of meat for making jerky. For easy-to-chew jerky, slice meat against the grain, into approximately 1" wide by 4" long by 1/8" thick strips. If you prefer gnawing on your dried meat, slice WITH the grain into 1/4" by 5" strips. I’ve always wanted to make jerky but have been a little intimidated by the whole process. This sounds easy to me! Do you ever freeze your jerky? If I went through the work of making it, I’d probably want to make a larger batch but I don’t think I could eat that much in a week or two. Thanks for this. I think I need to cut my beef thinner, mine ends up so chewy. Has anybody tried this with ground beef? I’d like the seasonings but am unsure of how to adjust it to not be a marinade. I have always wanted to try a ground beef jerky, but always chicken out … plus I don’t have a meat grinder and from what I have read only lean meats should be used for jerky as the fat can go rancid. Sorry I can’t be of more help. Can this be made without liquid smoke? I have a sensitivity to it. Can I omit the sugar? I’m very hypoglycemic and can’t do sugar (gives me migraines). Or could I sub with monk fruit sugar? Is the sugar essential to preserving the meat?